In 2002 Ms. Susan Suah was co-opted into NACSCOM and elected as Hon. Secretary General of NACSCOM from 2004-008.
of the renovation of NACSCOM’s office and the DayCenter. Besides that she was in the Committee for NACSCOM’s Fund Raising and the Annual Charity Dinner 2013. Trained in London as an Interior Designer, she returned in 1972 and worked in Singapore. In 1982 she established her own Design Consultancy handling various prestigious projects in Malaysia. In 1985 she co- founded PJ College of Art & Design and was the Principal of the design college until her retirement in 2003. She was also one of the founding members of The Malaysian Society of Interior Designers (MSID),Secretary General 1988-1995, and was active and represented MSID to conferences nationally and internationally. Ms. Susan Suah is also one of the founding member of Suah Carelink Bhd since 2003 a family charity foundation. 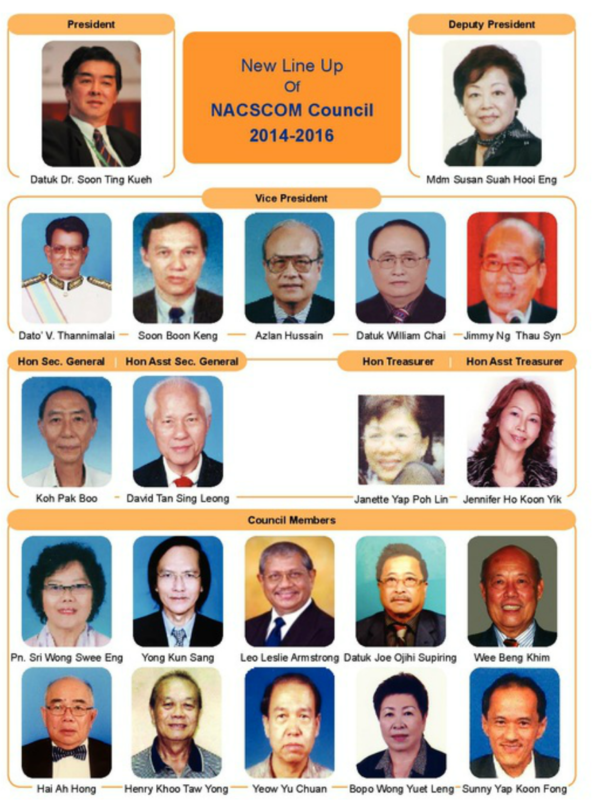 Dato V. Thannimalai JP is currently the most senior member of NACSCOM Council. He has been the Vice President of NACSCOM Management Council since 1994. In 1993 he was one of the co-founder of Sungai Petani Senior Citizens Association which after a year later in 1994 became NACSCOM Affiliate. From 1995 he became the President of Sungei Petani Senior Citizens Association till today. He is always actively involved in organizing various activities for the well being of the elderlies. Dato’V. Thannimalai was a headmaster, an active unionist, politician and a social worker in 1960s. Through his achievements, he was conferred in 1979 Justice of the Peace (JP)Kesatria Mangku Negara (KMN) by the Yang Di-Pertuan Agong Malaysia and in 2008 he was conferred the title ‘Dato’ by his Royal Highness the Sultan of Kedah. He was also appointed the Commissioner of Oaths from 1997-2007. VICE - PRESIDENT SOON BOON KENG, PHP, PIS, PPN, AMN. Mr. Soon Boon Keng has been the Vice President of NACSCOM Council since 2010. Other voluntary services he is currently involved are as : Deputy President of Johor Cricket Council, Honorary Secretary of Senior Citizens Association Johor Bahru and Honorary Treasurer of Johor State Welfare Council ( MKMNL), the Secretary of JCC Non Bender Cricket Club, Member of Asia Pacific Forum on Families Malaysia (APFAM), Committee Member of Johor Bahru District Children’s Welfare (JKKD) and Committee Member of Johor Consumer Welfare Association (JCWA). Since 1960 he had served in various government departments, such as State Treasury, Inland Revenue Department, JBA, and JKR. He retired in 1998 as Senior Administrative Assistant in Johor Labour Department. Mr. Soon received the award of “ Anugerah Warga Emas Peringkat Nergri ”Johor -2006. His past voluntary services began since the 1980s. En Azlan has been the Vice President of NACSCOM Council since 2010 and currently also the President of Sentral Senior Citizens Association (SSCA). He has been active in NACSCOM and has served as Committee Chairman of Membership and Affiliates Affairs, in the Committee of Fund Raising, Old Folks Homes and Government Affairs. En. Azlan served 36 years with Malaysia Airlines as the General Manager. Presently, he is an Advisor on Business Development with an international Hotels Group. He is also a Consultant in Aviation, Airlines and Tourism Industries. He is the President of the University of Third Age (U3A) Life Long Learning Association. Despite his busy schedule he is a Council Member of Tourism Development Council and member of the Advisory Panel, Parks, Garden and Landscape, Dewan Bandaraya Kuala Lumpur. En. Azlan is also a member of the steering committees of both Ministry of Federal Territory LA21 and Putrajaya Local Government LA21. VICE - PRESIDENT DATUK WILLIAM CHAI, PGDK, ASDK, AMN, ADK, PPN. Datuk William Chai is the President of Sabah Council of Senior Citizens “COSCA” 2014-2015 and also President of Sabah Association of Senior Citizens Kota Kinabalu. He was elected as Member of NACSCOM council 2012-2014 and in May 2014 was elected as Vice –President of NACSCOM. Datuk William Chai was an accountant in the Health Services Sabah. He had served the State Government and Federal Government in Sabah Malaysia for 32 years where he retired in1995. From 1960s onwards he also served as volunteer in many organizations. Such as: member of the British Red Cross Society 1960, and in 1976 was elected as Chairman of Malaysia Red Crescent Society Sabah Branch. Then in 2009 he was elected as National Vice-Chairman of Malaysia Red Crescent Society Kuala Lumpur. In 1981 he was one of the founding member and Vice-President of the Society of Sabah Heart Fund until now. Datuk William Chai was awarded the Distinguished Service Medal in 2006 by the Malaysian Red Crescent Society Kuala Lumpur. He was awarded the “Outstanding Volunteer for Social Services” or “Tokok Sukarelawan Kebajikan” in1997 by the State Government of Sabah. Mr Jimmy Ng has been the Chairman of Persatuan KOAT ( a senior citizens club which he help to establish in 1992) and the Deputy President of Council of Sabah Senior Citizens Organizations (COSCA). Currently he is immensely involved in Senior Citizens Welfare and Activities. He is also one of the Vice-President of NACSCOM. Mr. Jimmy Ng was a Teacher by profession, and was involved in many educational programmes and training. He was offered a Sabah state scholarship for his tertiary education in England where he obtained his BA(ED) in 1980. In 2012, Mr. Koh was co-opted as a member of NACSCOM Council and also served as secretary of Membership and Affiliates Affairs sub-committee. He was a member of Setapak Old Folks Home subcommittee 2013-2014 and also member of NACSCOM Constitution Review subcommittee 2012-2013. Mr. Koh is currently the Honorary Secretary General of NACSCOM, and he is also member of Setapak Old Folks Home Committee. He graduated from University of Malaya with Bachelor of Agriculture Science in 1969. Currently he is the Managing Director of Trans-Edu Publishing Bhd. Since 2008 he is the Hon. Secretary General of Damansara Jaya Senior Citizens Association (DJSCA) and also a member of Persatuan Kebajikan Usiamas Malaysia since 2005. Mr. David Tan has been a member of NACSCOM Council since 2008 and is currently the Honorary Assistant Secretary General. He is also the Committee Chairman of NACSCOM Activities. In 2008 he became Deputy President of Sentral Senior Citizens Association, Petaling Jaya. In 2013 he was elected as the Vice-President of Happy Senior Citizens Association Klang. Generally Mr. David Tan enjoys promoting activities like singing, dancing and travelling for the senior citizens. Since retirement Mdm. Janette Yap has been active in the activities of various senior clubs and associations. Presently she is a member of Sentral Senior Citizens Association Petaling Jaya (SSCA), and the Honorary Treasurer of NACSCOM Council. She is also currently a Consultant of a Unit Trust organization. Mdm. Janette Yap was trained in Accounting and Management and has held various positions like – Personnel/Administration Executive, Accounts Executive, Finance/Administration Manager and Human Resource Manager. Senior Citizens Association Petaling Jaya (SSCA) and currently she is the Vice-President of SSCA. In 2009 she was a member of NACSCOM Council and currently she is NACSCOM Honorary Assistant Treasurer. Jennifer Ho has been the group leader of NACSCOM Golden Voice Choir since 2009. This Choir has performed in numerous NACSCOM’s functions and other charity functions. Besides that she is always busy organizing monthly social activities and other functions like Chinese New Year gathering, Health Talks, cooking demonstrations etc.